Featuring over 500 hours of battery life, the Peltor Tactical Sport has numerous user-friendly features that make this a perfect choice for the serious or casual shooter. 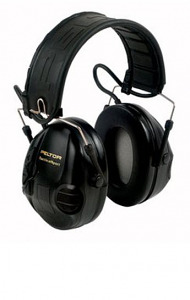 Loud sounds are suppressed while ambient sounds are enhanced to allow for the shooter to hear more clearly. Features an audio jack for various electronic devices such as cell phones, MP3 players, or dog trackers, interchangeable black and orange ear cup covers, recessed cup to minimize stock interference, and an adjustable, stainless steel padded headband that folds easily to fit in your range bag. NRR 20dB.